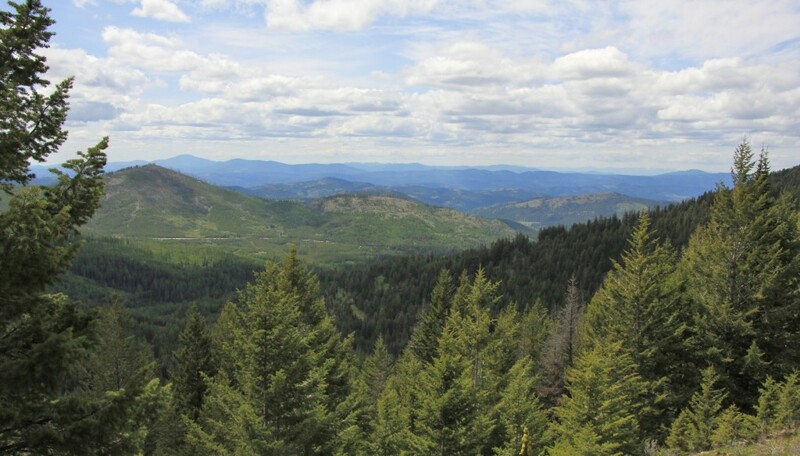 May brings a mixed bag of weather to the Pacific Northwest, especially in our home area where the states of Washington, Idaho, and Oregon all meet. Typically, the weather is nice enough by mid-May that we start dreaming of camping and hiking for Memorial Day, but more often than not it ends up raining all weekend. Our plan of attack is always to keep the weekend free and then go where the weather looks the best. 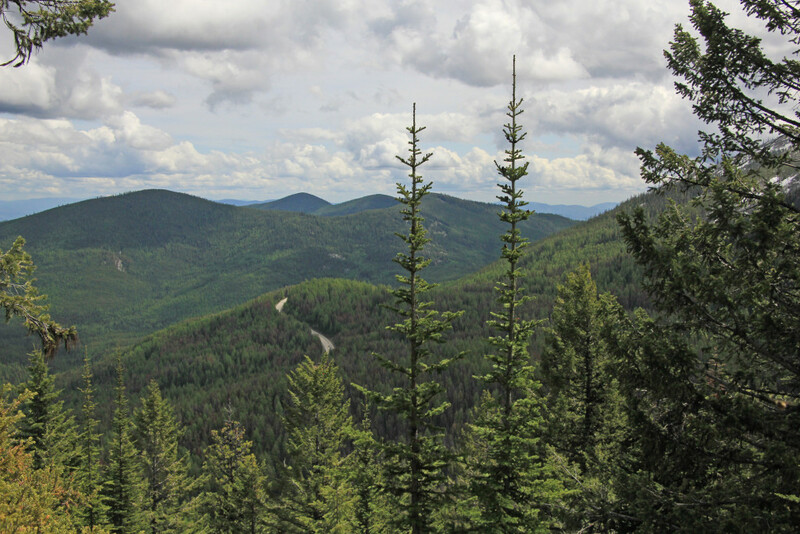 The Kettle River Range forms an imposing wall across the western Columbia Highlands, with several peaks exceeding 7,000′. 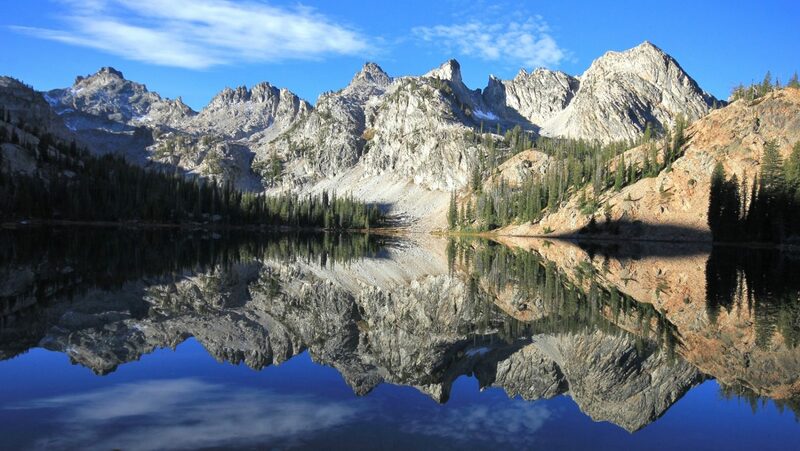 It’s an impressive range, yet the peaks, among the oldest in Washington, are gentle giants. Their smooth contours and rounded ridges make them more like the Smoky Mountains of North Carolina than the North Cascades. 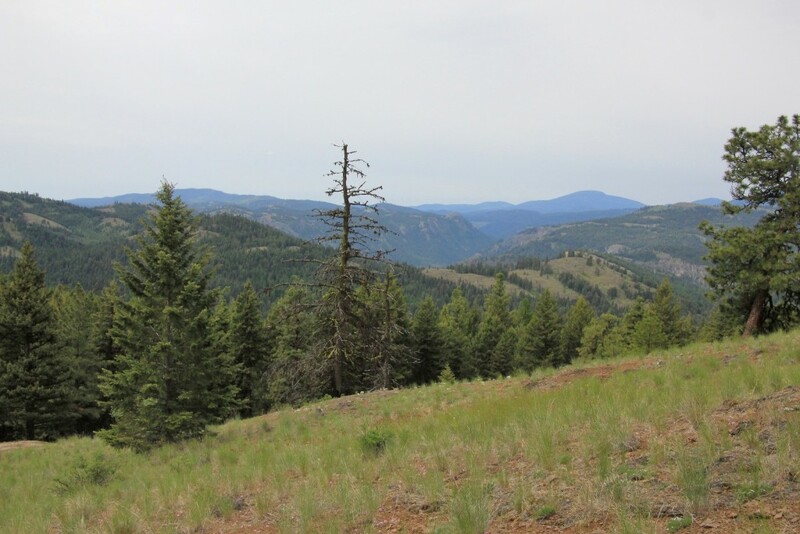 The surrounding countryside resembles Montana, with its big-sky valleys, parkland pine forests, and golden grassy hillsides… The Kettles contain some of the largest roadless tracts of national forest lands in Eastern Washington… With miles of excellent trails traversing them… the Kettles offer some of the finest hiking in the state. This was still early in the year for the mountains. 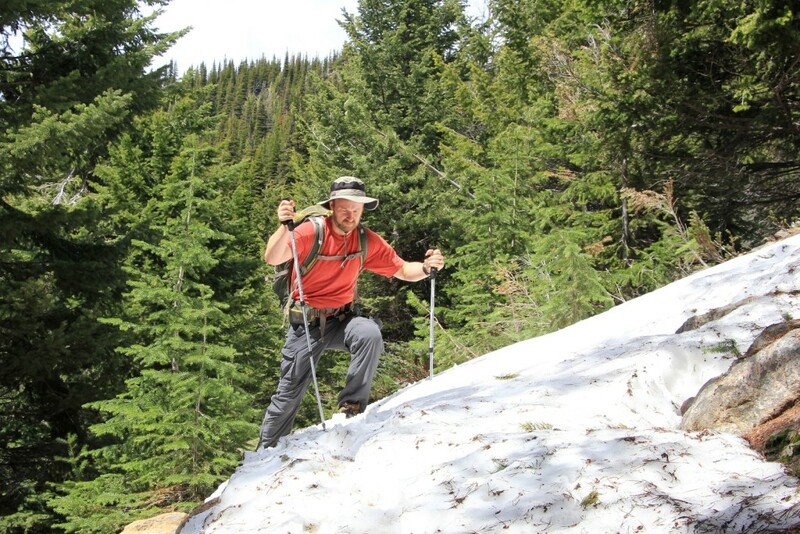 Odds were good that high elevation trails could still be snow covered. 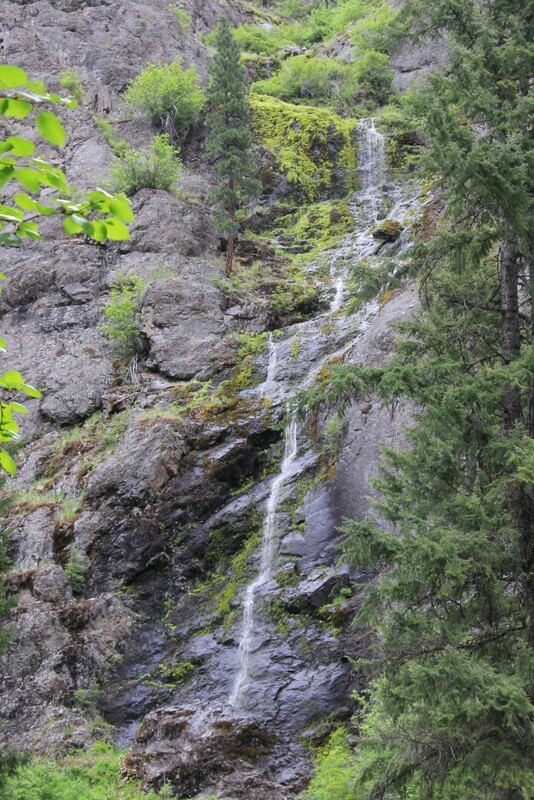 Since we were new to the area, I called the local forest service office to inquire about trail conditions. 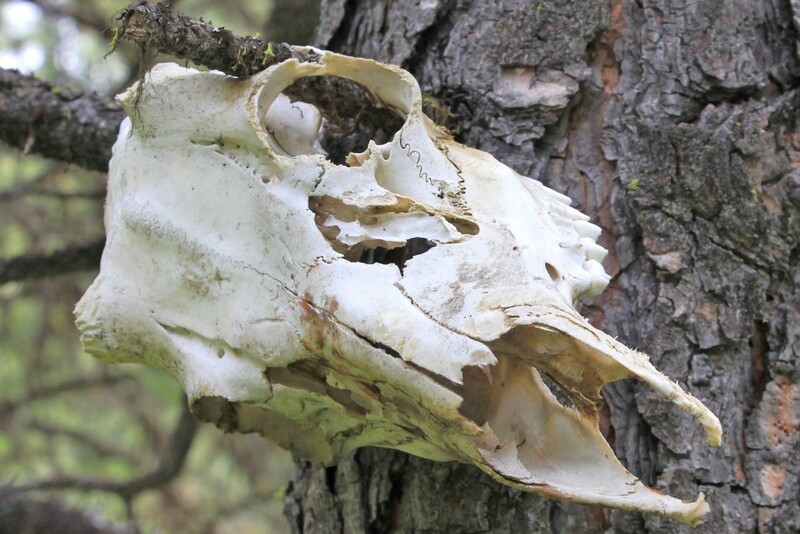 The woman who answered the phone sounded older and was exceptionally friendly; however, she did not seem very knowledgeable about the area trails. She wasn’t familiar with the trails I asked about (from what I can tell these were some of the more popular trails in the area), but said she thought we’d be fine. We hit the road at 7:00 Saturday morning. It had rained overnight, but the clouds were clearing and it was a beautiful morning across the Washington Palouse. At Spokane we hit US-395 north through Chewelah, Colville, and Kettle Falls. This is a beautiful drive. 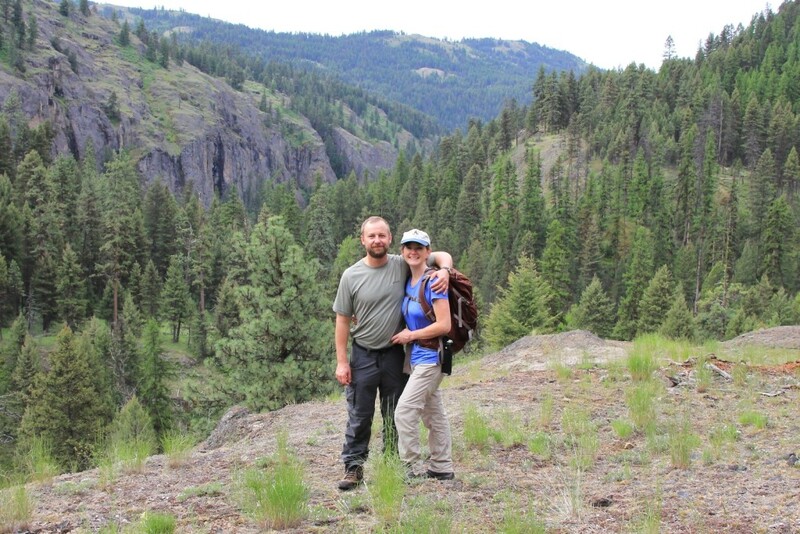 At Kettle Falls we crossed the Columbia River and headed west on WA-20, Sherman Pass Scenic Byway. At Sherman Pass we parked at the Kettle Crest Trailhead. I stared north toward Sherman Peak and saw quite a bit of snow. 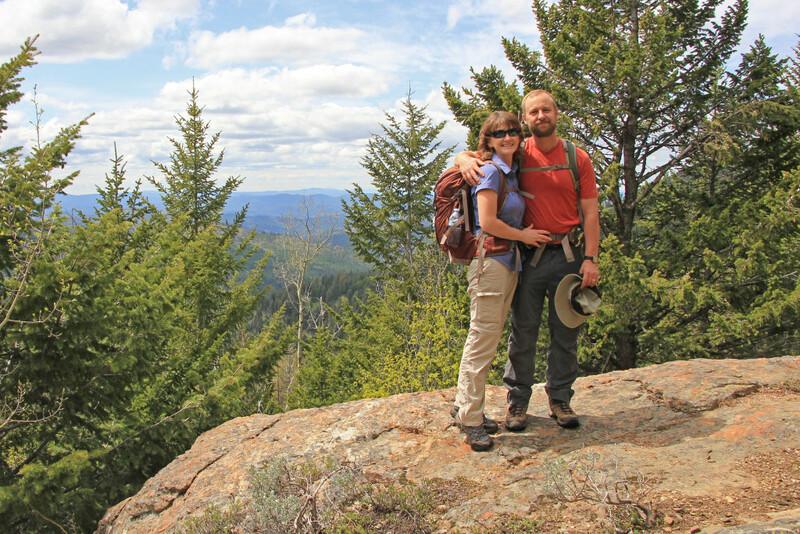 We talked with a couple who had just finished a backpack on the Kettle Crest South trail. They reported hitting lots of soft snow. Even with snowshoes on, they had a hard time not sinking deep into the snow. We were headed out on the Kettle Crest North trail which appeared to have significantly less snow, but odds looked good that we might get into the white stuff. We were all set to go, so we figured we’d make the best of it and see how far we could get. 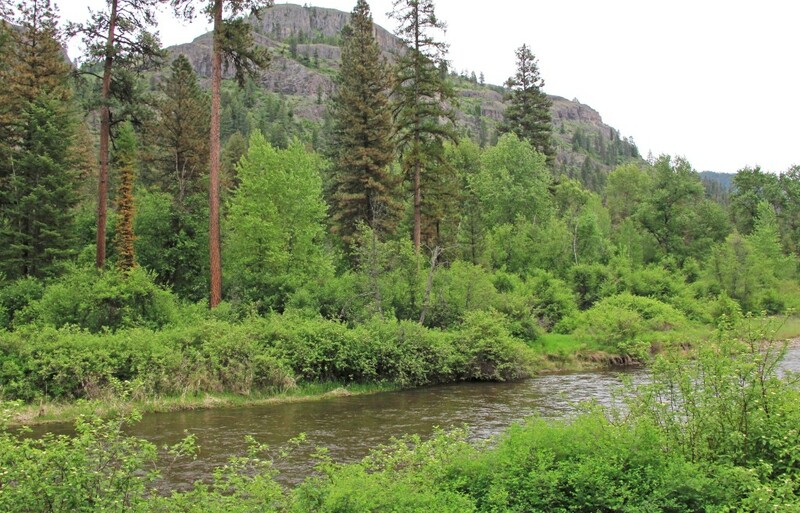 Sherman Pass (elevation 5,575’) crosses the Kettle River Range in the Colville National Forest and is the highest Washington pass that is maintained all year. As you might have guessed, it was named after Civil War general William Tecumseh Sherman who traveled across the pass in 1883. 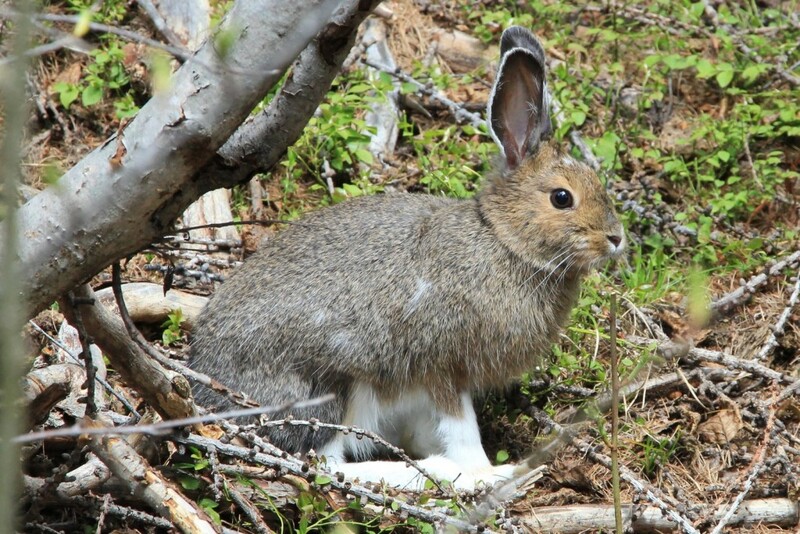 We grabbed our gear and hit the Kettle Crest North trail and quickly began a relatively gentle, but continuous climb. The trail was in great condition and we enjoyed partly cloudy skies with temperatures in the upper 50s- absolutely perfect for hiking. 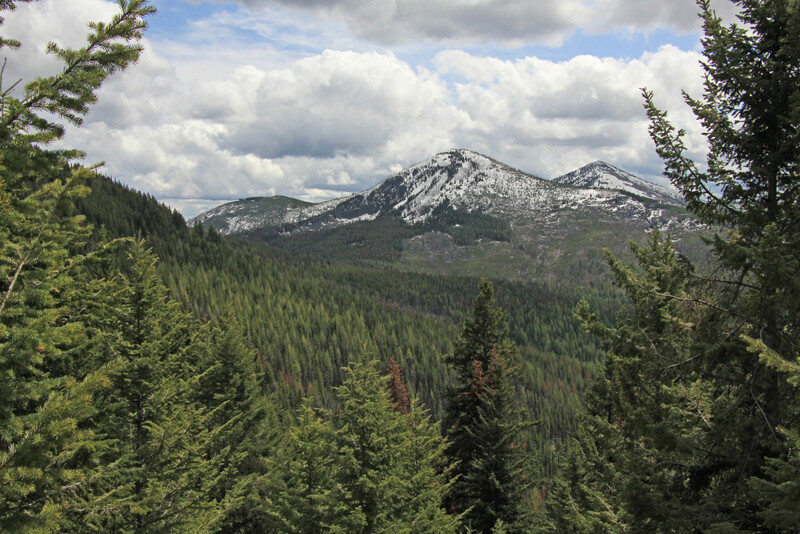 The trail gave nice views of Sherman Peak to the north and the Okanogan Mountains to the West. At 2.4 miles, we turned off onto the side trail to Columbia Mountain Lookout. After a short distance, we reached the fenced spring I had read about. It looked like it had suffered some damage over the winter, but it was a nice place to stop for an apple break. From the spring, we continued our climb toward the Columbia Mountain Lookout and almost immediately hit patches of soft knee deep snow that slowed our going. As we climbed, the patches covered increasing amounts of trail and the snow got deeper and harder to navigate through. On the last spur up to the lookout, it became difficult to find the trail which had become quite steep and completely snow bound. Unsure of where we were going, we finally turned around with the sinking suspicion that we were likely just shy of the Lookout. We vowed to go back and get our revenge later in the season. Our total distance hiked for the day was 7.5 miles with approximately 1,500’ elevation gain. It was late afternoon and time to think about a place to camp. We considered camping at a nice spot on top of the pass, but the forecast was for high winds and cold temperatures at the higher elevation. We dropped down off the pass to the small town of Republic. From there we turned south and headed for Ten Mile Campground which I had read about. When we arrived we were disappointed to find it was gated with a “closed for the season” sign. Darn, looked like a nice little campground. We drove a few more miles south to the Thirteen Mile Canyon trailhead where we planned on hiking on Sunday. We were delighted to find a very nice spot there. We had the place all to ourselves complete with nice outhouse and views of the colorful rocks above the San Poil River and Thirteen Mile Creek Canyons. Sunday morning we were on the Thirteen Mile Canyon trail by 8:00. The trail begins on Thirteen Mile Creek, but immediately begins climbing. 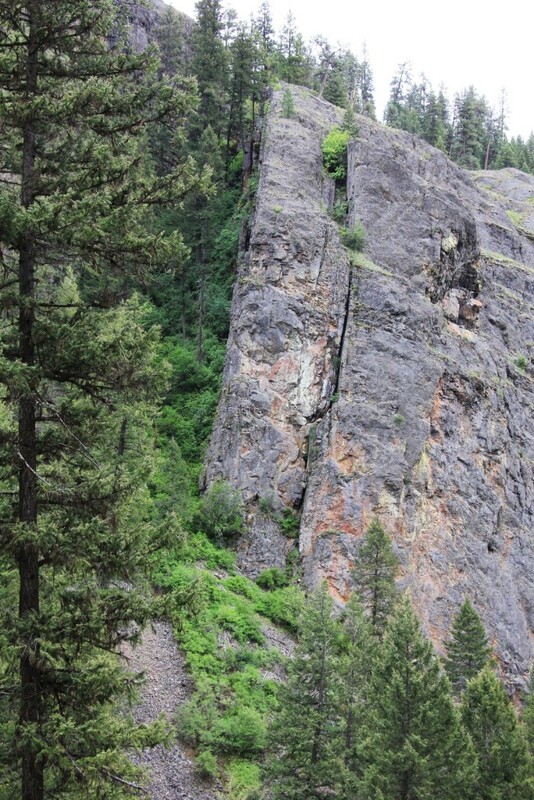 The first mile is through the narrow creek gorge and the rocks are quite pretty. Wildflowers were everywhere and there was a small seasonal waterfall. By 2 miles in, we had climbed from 2,050’ ft to 3,000’ ft and were above the canyon. Hiking was much easier from this point on until the final climb. 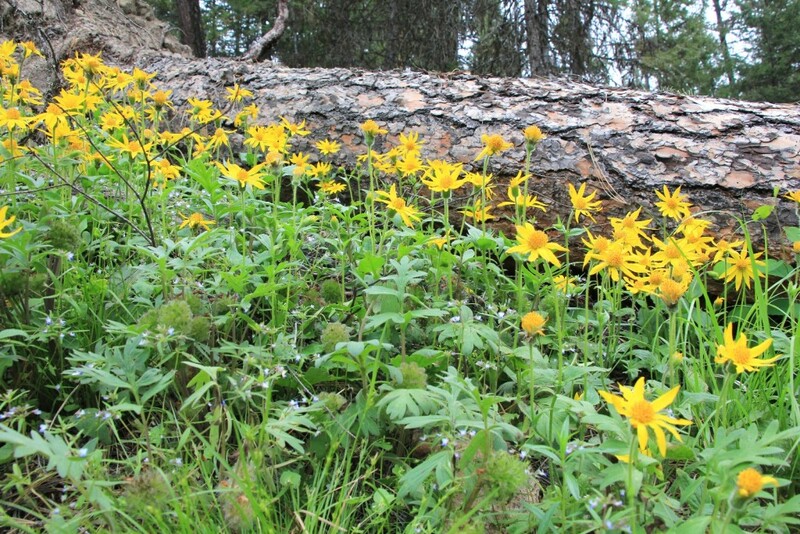 The trail alternated between far reaching views and moderately dense forest- all the while surrounded by wildflowers. We had two stream crossings, but both were small and easy. Conditions were cloudy for most of the hike with comfortable hiking temps in the 50s. We enjoyed solitude for most of the hike, only passing two other parties- all backpackers on their way out. One man in the second group asked if we had seen any wildlife. We told him we’d seen several rabbits and a few deer. He then excitedly and proudly told us of stepping on a rattlesnake on his hike in! His buddies all said he jumped about six feet straight up in the air. I found this to be a credible enough story considering the guidebook had warned of snakes. At just over 4.5 miles in, we reached the high ground and the turnaround point for our trip at just over 3,750’ ft elevation. We had climbed approximately 1,900’ ft total when factoring in the ground we lost and had to regain on a couple occasions. We stopped for a snack break and to enjoy the summit views before beginning our return hike. We finished our hike around 1:30. The GPS clocked us at 9.25 miles round trip. It was clouding up and the forecast was for rain that night. I had hoped for a sunny afternoon to drive around and get pictures of the area lakes and back up on Sherman Pass, but that wasn’t going to happen. I suggested we have a quick dinner back at camp and then head home since we had completed our hikes and all that appeared left was a soggy evening around camp. Jason was in agreement so we ate a late lunch/early dinner, packed up, and pulled out at 2:15. We hit WA-21 south which runs through the heart of the Colville Indian Reservation. The highway parallels the San Poil River all the way to the Columbia River and it was a gorgeous drive. We dropped down to the Columbia River at the Keller Ferry terminal. 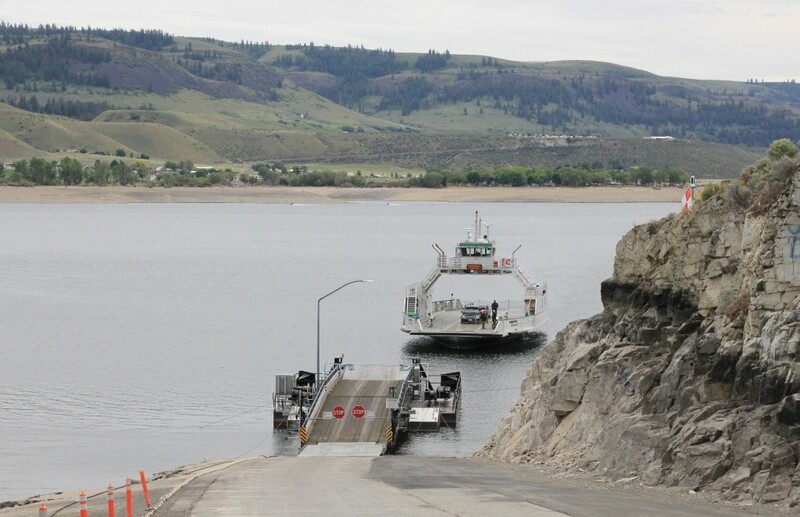 The Keller Ferry crosses Lake Roosevelt, a dammed section of the Columbia River. The ferry has been in operation since the 1890s and was the first ferry crossing operated by the State of Washington. It runs 6:00 a.m. to Midnight 7 days per week and is free. The 1.25 mile ride across takes approximately 10 minutes. We enjoyed the short ride across. I wish there had been better skies for photos, but the storm was getting close. I noticed that the water levels were quite low. The deck hand said levels are typically low this time of year as they prepare for peak spring runoff in June; however, he also noted that these were exceptionally low levels because of the ongoing repairs at the Wanapum Dam downstream. Rain hit as we continued our drive home through the tiny Eastern Washington communities of Wilbur, Creston, Davenport, Harrington, Sprague, and St. John. It was nice to arrive home to a dry bed after two great days of early season hiking in a new area. Life is good. Looks like a nice area! This report, along with your Rainier reports, are making me miss the mountains. Lisa, thanks chica! We’re missing them too. At the rate things are going around here, we’re thinking we’ll be able to get into some of the low elevation mountains any time now.